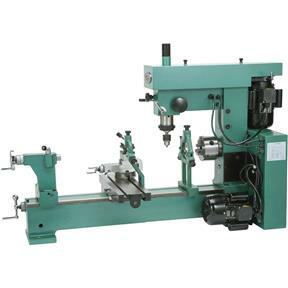 Need a larger combo machine? One with an awesome 31" between centers and 16-1/2" swing? Then the G9729 is the answer. With great features like a magnetic controller and a forward / reverse switch, hardened and ground bedways, two motors for extra power and a 4-way turret tool post makes this a real do-it-all machine. 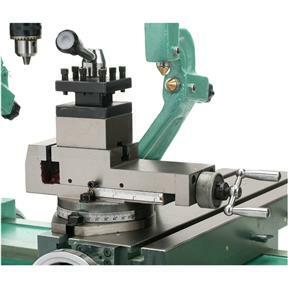 Cuts inch and metric threads with ease and includes a built-in milling table with T-slots, a steady rest and a follow rest. 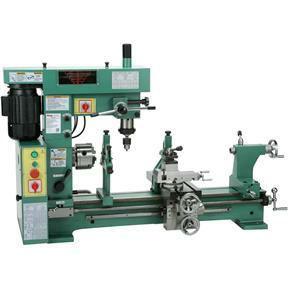 Convenient window allows easy verification of drill spindle speeds. An incredible machine at an unbeatable price! Swing over cross slide: 11-1/2"
My G9729 has paid for itself 7 times over by making custom rifle sights and ski boat parts. 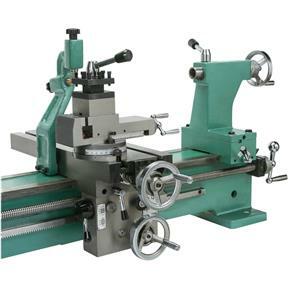 Just realize when buying these types of machines that it is not a precision tool room lathe/mill but for typical tasks it works fine. I've had mine about a month and I've been happy with its performance so far, though I have had a couple issues. It really needs taken apart and thoroughly cleaned first and minor adjustments need made to tighten everything up for a good surface finish. The thing that bothers me most though is the nylon gears inside the lathe head. There are 2 plastic gears that run the lead screw, which wouldn't bother me so much if they were easily accessible, but they are not. I would assume they used the plastic gears as a sort of fail safe in case you run the carriage into the chuck, but they should have made them strong enough so that they don't get damaged just by stalling the lathe for a second. That's what happened to me, and they are a bit of a pain to change out. If they were going to use any plastic gears at least they should have used them on the end gears or something. Really what point is steel end gears with plastic gears leading to them? Anyhow, aside from that, I'm happoy with it. Plenty of capacity for larger projects and plenty of power for its size. I am a garage/basement hobbyist and I think you are too if you are reading this review. So far, the machine is perfect for my needs. My motivation for buying this was to make some part for a hot rod that I could not otherwise buy. The three jaw chuck spins at .003 right out of the box. I have not tried to fuss with it yet to get it better. I bought a 6" four jaw chuck, the backing plate blank that was included with the lathe made it very simple to mount. Everything works and the machine runs pretty smooth. I have not done much with the mill yet. My only issue with the milll is that the spindle is quite high above the carriage and vice. In order to mill a small part using an end mill in a collet you will need to come up with a solution to raise the work piece. I happen to have some 6" cast iron riser blocks and they work quire well. I was able to mill some straight lines in steel without a problem. I do recommend following the break in procedure and doing the oil change. As a matter of fact, I will be doing another oil change soon. There was quite a bit of metal in the bottom of the bucket from the first change. The machine takes about a quart of oil. The shipment was prompt and the lift gate delivery was a lift gate. However, you need a forklift or an engine hoist to move it around once you get it on the garage floor. 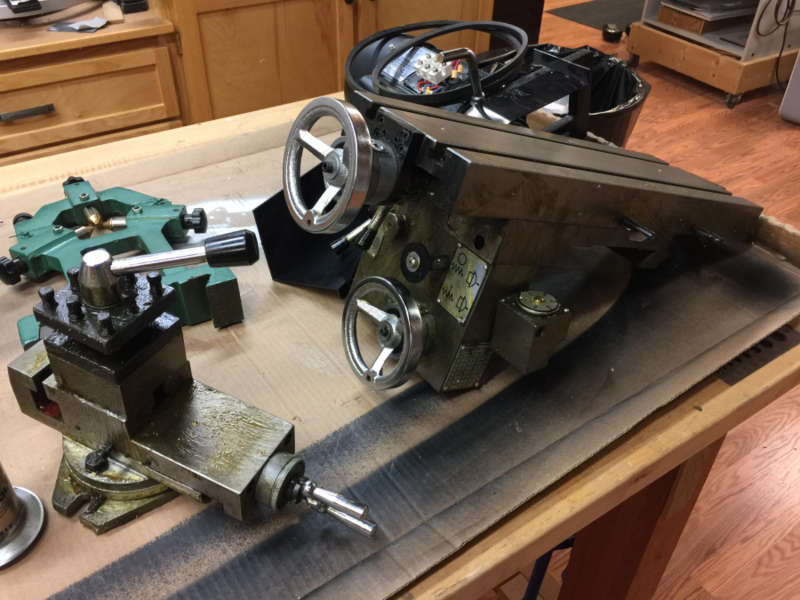 The lathe comes fully assembled and covered in grease. I took the entire machine apart, mainly to facilitate moving it to the basement, and then cleaned it and reassembled. A few parts needed to be de-burred, but in general I was happy with the design and the construction. As you can see in the photos, I used the HF Yukon cabinet as a base. Works well if you take the wheels off. I tried it with the wheels and it was too tall and scary. For the price and the size I highly recommend this machine. 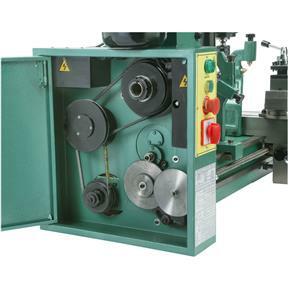 I really like the lathe distance over the bed, it will allow me to do many things that you could not do on other small machines. Of course, bigger is always better, unless you are the guy hauling it to the basement. 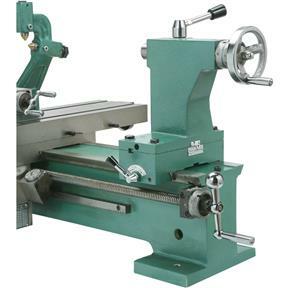 Good product , need to advise customer that they will need to clean the lathe from when they made it ! Lathe was greased very well when I received it but the metal shavings from when it was made was in the grease ! Still happy ! Had bad delivery service keep putting me off to deliver it from Shreveport Louisiana, so me and my wife drove to Shreveport to pick it up on a Friday at 7:45 pm we live one hour and fifteen minutes from Shreveport and we paid for lift gate service but other than that Im still happy thank you! I have own this 3 in 1 for just over 6 mo. and use it quit a bit at work. used doing odds and ends around the shop and it work great. always look forword to the next job I use it on.